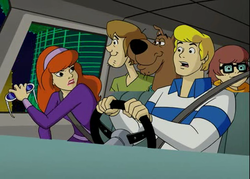 Fred Jones, Daphne Blake, Velma Dinkley, Shaggy Rogers and Scooby Doo are the five members of the Mystery Inc team that go around the world (with their van The Mystery Machine) and solve mysteries. Fred (the blonde one) is their leader that most of the time drives the van and sets traps, his color is blue. Daphne loves fashion and she usually screams Jeepers, she loves pink and purple. Velma is the brain of the team, with great knowladge, technology, Velma uses the clues to solve the mystery, her color is red (and orange). Shaggy is the best friend of the dog, Shaggy, they love eating, but they never get fat. With color of green (and red) Shaggy always messes up the trap with Scooby (the are also always the bate, doing it for scooby Snacks) but at the end, after lots of chasing, they catch the monster! The gang in 99% of the episodes were together without any private problems until Mystery Incorporated, as drama came between Fred and Daphne, Velma, Shaggy and Scooby (teen and love problems). Click here to go to the page "The Gang"
"What is it?" always turns to "Who Is It?"! Mystery, Inc always catch the villains, and it turns out to be someone of the suspects, and mostly, the one that is unexpected (or maybe the most expected, cause we will never expect the most expected, but the most unexpected)! Check out our page with info about all villains (still being updated) that Scooby and the gang has ever catched! Click here to go to the page "Villains"
Years ago, just like the one today, there was a team solving mysteries in Crystal Cove too! 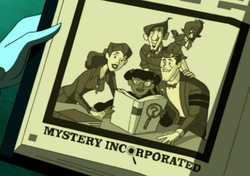 The original Mystery Incorporated held the four members and their parrot that today has gone crazy. They are still missing, at least two of them, as they seeked the lost treasure of Crystal Cove! Click here to go to the page "Original Mystery, Inc"
The Hex Girls are gonna put a spell on you! 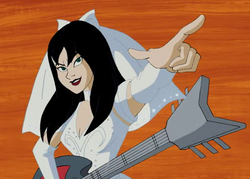 The most famous girl rock band in the Scooby-Doo! world are these three girls that can play the guitar and the loud drums! They've appeared in two of the TV shows series and in two movies with the famous songs "I'm A Hex Girl", "Earth, wind, fire and air" and "Trap Of Love"! Click here to go to the page "The Hex Girls"